Julius Rosenberg (May 12, 1918 – June 19, 1953) and Ethel Greenglass Rosenberg (September 28, 1915 – June 19, 1953) were American Communists who received international attention when they were executed for allegedly passing atomic weapons secrets to the Soviet Union, as they were the first American civilians to be executed for espionage, and suffer such a penalty during peacetime. In the 1990s, Soviet communications decrypted in the Venona project were released, which supported the general allegations of espionage by Julius, though not supporting the specific charges on which the Rosenbergs were convicted. Since their execution the degree of guilt of the Rosenbergs, and the appropriateness of their sentence, has been controversial and a subject of perennial debate amongst scholars. The Rosenbergs had two children, Robert and Michael, who were orphaned by the execution. Julius and Ethel Rosenberg Ethel and Julius Rosenberg are interred at Wellwood Cemetery in Pinelawn (Suffolk County), New York. In the Cold War, as both sides desperately tried to match the military capacity of the other in pursuance of the policy of Mutually Assured Destruction, it is possible although not provable that the Rosenbergs actually helped to avoid a direct confrontation between the two main super-powers. Both sides employed espionage. The United States used U-2 spy planes to illegally fly over Soviet territory. There is little doubt that the U.S. made use of information passed on by Soviet double-agents and by some who sold secrets for cash. The mistake lay in getting caught. This does not as such justify treason but it does point out that during the Cold War, as during most conflicts, there is a thin line between what is and what is not morally or legally acceptable in prosecuting the effort to defeat the enemy. War – hot or cold – however just the cause, however unavoidable in the face of a greater evil is at best a dubious moral enterprise. Julius Rosenberg was born to a Jewish family on May 12, 1918 in New York City. He became involved in and quickly became the leader of the Young Communist League in New York. In 1936, he met Ethel, through the Young Communist League, and they married three years later. Julius graduated from the City College of New York with a degree in Electrical Engineering in 1939, and the next year, in 1940, joined the Army Signal Corps, where he worked on radar equipment, and spied on the U.S. Government. Ethel Greenglass was born on September 28, 1915, in New York City, also to a Jewish family. She was an aspiring actress and singer, but eventually took a secretarial job at a shipping company. 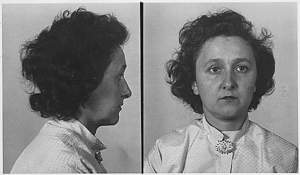 She became involved in labor disputes and joined the Young Communist League, USA, where she first met Rosenberg. The Rosenbergs had two sons named Robert and Michael Meeropol, who were adopted by teacher and songwriter Abel Meeropol after their parents' execution. According to his former KGB handler, Alexandre Feklisov, Julius Rosenberg was originally recruited by the KGB on Labor Day 1942, by former KGB spymaster Semyon Semenov. Julius had been introduced to Semenov by Bernard Schuster, a high-ranking member of the Communist Party USA as well as Earl Browder's personal KGB liaison. After Semenov was recalled to Moscow in 1944, his duties were taken over by his apprentice, Feklisov, which is how he became Julius' handler. According to Feklisov, Julius was his most dedicated and valuable asset, providing thousands of classified reports from Emerson Radio, including complete schematics for a proximity fuse, the same design that was used to shoot down Gary Powers's U-2 in 1960. Under Feklisov's administration, Julius Rosenberg is said to have recruited sympathetic individuals to the KGB’s service, including Joel Barr, Alfred Sarant, William Perl and Morton Sobell. According to Feklisov's account, he was supplied by Perl, under Julius Rosenberg’s direction, with thousands of documents from the National Advisory Committee for Aeronautics as well, including a complete set of design and production drawings for the Lockheed's P-80 Shooting Star. Feklisov claimed that he learned through Julius that his brother-in-law David Greenglass was working on the top-secret Manhattan Project at the Los Alamos National Laboratory and used Julius to recruit him. During World War II, the USSR and the U.S. became allies in war, but the U.S. government was highly suspicious of Joseph Stalin's intentions. As such, the Americans did not share information or seek assistance from the Soviet Union for the Manhattan Project. However, the Soviets were aware of the project as a result of espionage penetration of the U.S. government, and had made a number of attempts to infiltrate its operations at the University of California, Berkeley. A number of project members, some high-profile, others lower in rank, did voluntarily give secret information to Soviet agents, many because they were sympathetic to communism (or the Soviet Union's role in the war) and did not feel that the U.S. should have a monopoly on atomic weapons. Many of these findings, of the information about the Manhattan Project, are said to be a result of Julius' espionage as well. After the war, the U.S. continued to resist efforts to share nuclear secrets, but the Soviet Union was able to produce its own atomic weapons by 1949. Its first nuclear test, Joe 1, shocked the West with the speed in which it was produced. It was then discovered in January 1950, that Klaus Fuchs, a German refugee theoretical physicist working for the British mission in the Manhattan Project, had given key documents to the Russians throughout the war. Through Fuchs' confession, U.S. and United Kingdom intelligence agents were able to make a case against his "courier," Harry Gold, who was arrested on May 23, 1950. A former machinist at Los Alamos, Sergeant David Greenglass, Ethel's brother, confessed to having passed secret information on to the USSR through Gold as well. Though he initially denied any involvement from his sister, Ethel Rosenberg, he claimed that her husband, Julius, had convinced his wife to recruit him while on a visit to him in Albuquerque, New Mexico in 1944, as part of Julius' work in passing government secrets to the KGB. Another accused conspirator, Morton Sobell, was on vacation in Mexico City when both Rosenbergs were arrested. According to his story published in On Doing Time, he tried to figure out a way to reach Europe without a passport, as he, too was at risk of arrest. However, he ultimately abandoned that effort and was back in Mexico City when he was kidnapped by members of the Mexican secret police and driven to the U.S. border, where he was arrested. The government claimed he had been deported, but in 1956, the Mexican government officially declared that he had never been deported. Regardless of how he was returned to the U.S., he was arrested and stood trial with the Rosenbergs on one count of conspiracy to commit espionage. Police photograph of Julius Rosenberg after his arrest. Julius Rosenberg hired Emanuel "Manny" Bloch, an attorney already well known for defending leftist sympathizers. The case against the Rosenbergs and Sobell began on March 6, 1951. The prosecuting attorney was U.S. Attorney Irving Saypol who had already successfully convicted Alger Hiss. He was assisted by Roy M. Cohn. The prosecution's primary witness, David Greenglass, Ethel's brother, testified that his sister Ethel typed notes containing U.S. nuclear secrets in the Rosenbergs' apartment during September 1945. He also asserted that a sketch he made of a cross section of the implosion-type atom bomb (the one dropped on Nagasaki, Japan, as opposed to the "gun method" triggering device that was in the one dropped on Hiroshima) was also turned over to Julius Rosenberg at that meeting. From the beginning, the trial attracted a high amount of media attention, but unlike the trial of Alger Hiss, there was no polarized response from observers. Aside from the Rosenbergs' own defense during the trial, there was not one single public expression of doubt as to their guilt in any media (even the left-wing and Communist press), before and throughout their entire trial. The first break in the media unanimity would not occur until August of 1951, when a series of articles ran in the independent left-wing newspaper The National Guardian. Only after the publication of those articles was a defense committee formed. Although the notes allegedly typed by Ethel apparently contained little that was relevant to the Soviet atomic bomb project, this was sufficient evidence for the jury to convict her on the conspiracy to commit espionage charge. It is believed that part of the reason Ethel was indicted along with Julius was so that the prosecution could use her as a 'lever' to pressure Julius into giving up the names of others who were involved. If this was the case and initial motive, it did not work. On the witness stand, Julius asserted his right under the U.S. Constitution's Fifth Amendment to not incriminate himself whenever asked about his involvement in the Communist Party or with its members. Ethel did similarly, and did not utter a word regarding her involvement. Due to their stoicism and tough nature, Julius and Ethel were not viewed sympathetically by the jury whatsoever. The Rosenbergs were convicted on March 29, 1951, and shortly afterwards, on April 5, were sentenced to death by Judge Irving Kaufman under Section 2 of the 1917 Espionage Act, 50 U.S. Code 32 (now 18 U.S. Code 794), which prohibits transmitting or attempting to transmit to a foreign government information "relating to the national defense." The conviction helped to fuel Senator Joseph McCarthy's investigations into anti-American activities by U.S. citizens. While their devotion to the Communist cause was well documented, the Rosenbergs denied the espionage charges until the end, even as they faced the electric chair. Their case has been at the center of the controversy over communism in the United States ever since, with supporters steadfastly maintaining that their conviction was an egregious example of persecution typical of the "hysteria" of those times (see McCarthyism), sue to the Red Scare of Communism. The case has often been compared to the witch hunts that marred Salem and medieval Europe; a comparison that provided the inspiration for Arthur Miller's critically acclaimed play, The Crucible. After the publication of the series in The National Guardian and the formation of the National Committee to Secure Justice in the Rosenberg Case, some Americans came to believe both Rosenbergs were innocent or received too harsh a punishment, and a grassroots campaign was started to try to stop the couple's execution. Pope Pius XII appealed to President Dwight D. Eisenhower to spare the couple, but he refused on February 11, 1953. All other appeals were also unsuccessful. The couple were executed at sundown in the electric chair at Sing Sing Correctional Facility in Ossining, New York, on June 19, 1953. This was delayed from the originally scheduled date of June 18, because on June 17, Supreme Court Associate Justice William O. Douglas had granted a stay of execution. That stay resulted from the intervention in the case of Fyke Farmer, a Tennessee lawyer whose efforts had previously met with scorn from the Rosenbergs' attorney. On June 18, the Court was called back into special session to dispose of Douglas' stay rather than let the execution be delayed for months while the appeal, which was the basis of the stay winded its way through the lower courts. The Court did not vacate Douglas's stay until noon on June 19. Thus, the execution then was scheduled for later in the evening after the start of the Jewish Sabbath. Desperately playing for more time, their lawyer, Emanuel Bloch, filed a complaint that this action offended their Jewish heritage, so the execution was then scheduled before sunset. Reports of the execution state that Julius died after the first application of electricity, but Ethel did not succumb immediately and was subjected to two more electrical charges before being pronounced dead. The chair was designed for a man of average size, and Ethel Rosenberg was a petite woman, so it is thought to be caused by the electrodes fitting poorly and making poor electrical contact. Eyewitness testimony (as given by a newsreel report featured in the 1982 documentary film The Atomic Cafe) describes smoke rising from her head. This, however, was not thought to be unusual due to the nature of the execution. Ethel and Julius Rosenberg are interred at Wellwood Cemetery in Pinelawn (Suffolk County), New York. In 1995, the National Security Agency publicly released documents from the VENONA project, an effort to decrypt intercepted communications between Soviet agents and the NKVD/KGB. A 1944 cable from New York City to Moscow clearly indicates that a spy with the code name ANTENNA and later LIBERAL (who the Federal Bureau of Investigation later decided was Julius Rosenberg) was engaged in espionage for the Soviet Union. Although his involvement was decided upon, the importance of the activities of LIBERAL/ANTENNA is not clear, particularly considering that the Soviets were receiving information on the atomic bomb from Klaus Fuchs, Donald Maclean, and Theodore Hall. From the VENONA transcripts alone, one could make a strong case that Ethel was never a spy. A document from November 27, 1944, specifically about "LIBERAL's wife" who is identified with the first name, Ethel, lists her as a "fellow countryman" and claims that she was aware of Julius's work. "LIBERAL's wife," Ethel was never assigned a code name, and the only reference to her, states she "does not work." Meredith Gardner, the Russian linguist who worked intensely on the VENONA decryptions, was quoted as saying that the work statement indicates that "LIBERAL's WIFE," Ethel, was not an espionage agent. Due to these findings, of Ethel's status as not working, along with her identity revealed in these papers, many believe that Ethel had nothing to do with the espionage committed by her husband whatsoever. Julius was always referred to as "ANTENNA" or "LIBERAL," never by his own name, which also led some to doubt that the FBI's connection of "LIBERAL" to Julius Rosenberg was accurate, but the preponderance of opinion is that LIBERAL/ANTENNA does refer to Julius Rosenberg, especially when considering his wife's identification by name. Even within their partners' opinions, Ethel and Julius sprouted controversy. In his memoirs, published posthumously in 1990, Nikita Khrushchev praised the pair for their "very significant help in accelerating the production of our atomic bomb." Alexander Feklisov, a former KGB officer, disagreed, stating that the information given was "meaningless." Faced with the VENONA transcripts and periodic revelations from former Soviet intelligence officials and archives, most critics of the Rosenbergs' prosecution today center on the usefulness of classified nuclear information allegedly provided by Julius Rosenberg and David Greenglass to the Soviet Union, the severity of their punishment, and the fact that not all Soviet spies were caught. Furthermore, not even all who were caught were prosecuted by the U.S. government. The atom bomb information that Greenglass claimed to have given to the Soviets appears to have been quite poor in comparison to the information given by Fuchs, who had a much more intimate understanding of the research being done and a much more sophisticated theoretical understanding of the mechanisms of the bomb, which was revealed by records of Fuchs' detailed transmissions in selective releases from Soviet archives. There was also significant information provided independently on Fuchs by the young scientist Theodore Hall, as well as potentially more agents, the identities of whom have not yet been fully established. Fuchs's data was the most valuable of all the Soviet atomic spies, giving a range of specific information on everything from nuclear-physics details, production of the plants for uranium enrichment, and the exact values for the bomb design itself. However, it was standard Soviet intelligence policy to use several intelligence sources if at all possible, as any information Greenglass provided could serve as a control to check the accuracy of other intelligence. Greenglass was spared execution in exchange for his testimony. More importantly, his wife, who according to the VENONA decrypts was given a code name, was never even indicted. He spent ten years in prison and was released in 1960, and has lived under an assumed name since his release. Decades later, in late 1996, Greenglass recanted and claimed that he had committed perjury when he testified about the typing activity of his sister Ethel. Greenglass said he chose to falsely testify against his sister in order to protect his wife and children. The Rosenberg case has always been a controversial issue, with opinion dividing along ideological lines. There are a number of points of contention that still hold, even after the VENONA transcripts were reveled. Ethel Rosenberg’s Involvement: While the preponderance of evidence indicates that Julius was involved in Soviet espionage, the record is unclear for Ethel. The VENONA transcripts taken at face value indicate no involvement by Ethel at all. During the trial, her brother, David Greenglass, a key prosecution witness, claimed that she typed numerous plans and correspondence for her husband. However, he later told his biographer Sam Roberts that he had perjured himself to lessen his own sentence and to help his wife avoid jail time. The Trial: There are many who have alleged that the political air of the time, and the documented pre-trial beliefs of Irving Kaufman made it nearly impossible for the Rosenbergs to have had a fair trial by an impartial jury. The Rosenbergs' lawyer, Emanuel Bloch, also made a number of massive legal blunders; such as moving to impound Exhibit 8—a Greenglass sketch purporting to show a cross section of the implosion-type atom bomb, thereby in effect acquiescing in the prosecution's charge that the sketch was in fact the "secret of the atom bomb," even though it was not. He also did not cross-examining Harry Gold, who in later trials was found to be highly unreliable in his testimonies. These mistakes of their lawyer in the trial suggest either his incompetence or inability to cope with such a high-profile trial. The role played by Assistant U.S. Attorney Roy Cohn, the prosecutor in the case, during the trial, is also controversial, since Cohn stated in his autobiography that he influenced the selection of the judge, and pushed him to impose the death penalty on both Ethel and Julius Rosenberg. The Sentence: The imposition of the death sentence upon the Rosenbergs has been the most controversial aspect of the case, as they were sentenced far more harshly than any other "atomic spies" at the time. Klaus Fuchs, who spied for many more years than the Rosenbergs, and provided far more sensitive nuclear information to the Soviet Union, and was caught, confessed, tried, convicted, and sentenced in the United Kingdom. He received fourteen years in jail, which was the maximum penalty in that nation for passing military secrets to friendly nations. In 1950, the Rosenbergs' conspiracy charge was prosecuted in the United States in the context of the Cold War and the concurrent Korean War, with Judge Kaufman placing culpability on the couple for the latter. It is not clear that the prosecution proved that the Rosenbergs' activities had caused the Korean War, even if they had given the Soviet Union the secret of the atomic bomb. These issues surrounding the Rosenberg case continue to remain points of contention, as the truth behind the fairness of their trial may never be known. The Rosenbergs' two sons, Robert and Michael, were orphaned by the execution, and no relatives dared adopt them for fear of ostracism, or worse. They were finally adopted by the songwriter Abel Meeropol and his wife Anne. Abel, under the pen name of Lewis Allan, wrote the classic anti-lynching anthem Strange Fruit made famous by singer Billie Holiday. He also co-wrote with Earl Robinson, The House I Live In, made famous in a short film starring Frank Sinatra to promote the war effort under a theme of tolerance for all types of Americans. Robert and Michael co-wrote a book about the experience, We are Your Sons: The Legacy of Ethel and Julius Rosenberg in 1975, and Robert wrote another book in 2004, An Execution in the Family: One Son's Journey. In 1990, Robert founded the Rosenberg Fund for Children, a non-profit foundation that provides support for children whose parents are leftist activists involved in court cases. Michael's daughter, Ivy Meeropol, directed a 2004 documentary about her grandparents, Heir to an Execution, which was featured at the Sundance Film Festival that year. ↑ Judge Kaufman's Statement Upon Sentencing the Rosenbergs on the site of the University of Kansas City-Missouri School of Law. Retrieved November 15, 2007. ↑ Cecil Adams, August 6, 2004. Were Ethel and Julius Rosenberg Soviet spies?, The Straight Dope. Retrieved November 25, 2007. ↑ The content and value of Fuchs's data for the Soviet program is discussed thoroughly in David Holloway's, Stalin and the Bomb: The Soviet Union and Atomic Energy, 1939–1956 (New Haven, Connecticut: Yale University Press, 1994). Holloway based his assessment of the value of Fuchs's data in particular from the intelligence transcripts and the reactions of key Soviet personnel—especially Igor Kurchatov—to Fuchs' data. The exact use of espionage information by the Soviets was somewhat complicated, due to mutual distrust of the espionage data and the Soviet scientists themselves by Stalin and Beria: see Soviet atomic bomb project for more information. ↑ Ethel Rosenberg's Brother Says He Implicated His Sister In Court, Pravda. Retrieved November 25, 2007. Feklisov, Aleksandr, and Sergei Kostin. The Man Behind the Rosenbergs. Berkeley, California: Enigma Books, 2001. ISBN 1929631243. Meeropol, Robert and Michael. We Are Your Sons, The Legacy of Ethel and Julius Rosenberg, Second Ed., Chicago, Illinois: University of Illinois Press, 1986. ISBN 0252012631. Meeropol, Robert. An Execution in the Family. New York City, New York: St. Martin's Press, 2003. ISBN 0312306369. Nason, Tema. Ethel: The Fictional Autobiography of Ethel Rosenberg. Delacourt, 1990. ISBN 0440211107. Philipson, Ilene J. Ethel Rosenberg: Beyond the Myths. Rutgers University Press, 1993. ISBN 0813519179. Sobell, Martin. On Doing Time, Rev. ed. CA: Golden Gate National Parks Association. (original 1974. 2001. ISBN 1883869536 includes CD of government documents released through Freedom of Information Act. All links retrieved June 13, 2018. 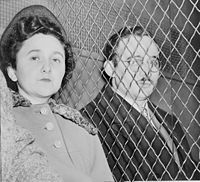 History of "Julius and Ethel Rosenberg"
This page was last modified on 14 June 2018, at 18:57.